This fresh and fruity Blueberry Spinach Salad is tossed with a homemade lemon poppy seed dressing that is crazy easy to make with just a few tasty ingredients. We love ours topped with candied walnuts and creamy feta the ultimate fruit and veggie salad! It’s blueberry season here in Florida and I am losing my mind with excitement. We have the cutest little blueberry farm that I start aggressively stalking once Spring rolls around. I basically live on their Facebook page, checking status updates daily to see when they’ll be opening for the season. Their berries are ginormous and so fresh/sweet/amazing that I will literally turn down chocolate in favor of these berries. They’re all the sweetness I need right now! I’m pretty sure the locals here agree because we’ve all literally picked so many blueberries that they closed for the week. Oops. We’re down to our last two cups of berries and I just had to squirrel away some of them for this fresh blueberry spinach salad. I’m a huge fan of blueberries in salad. Today’s scrumptious blueberry spinach salad is actually the third installment of a trio of salads featuring blueberries. 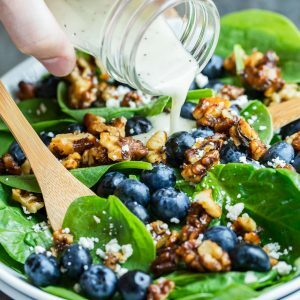 My Blueberry Broccoli Spinach Salad features a creamy homemade ranch dressing and my Cranberry Blueberry Salad is dressed with a fantastically fruity balsamic blueberry dressing. I love all three! I added feta cheese to mine for a touch of creaminess that totally rounds out the salad. Love goat cheese? Feel free to use that in place of feta! I bet gorgonzola would be amazing as well if you’re a fan. Any of these options will compliment the fruit in the salad and once the lemony dressing starts to soak in? SWOON! This sweet and savory salad is just the best! 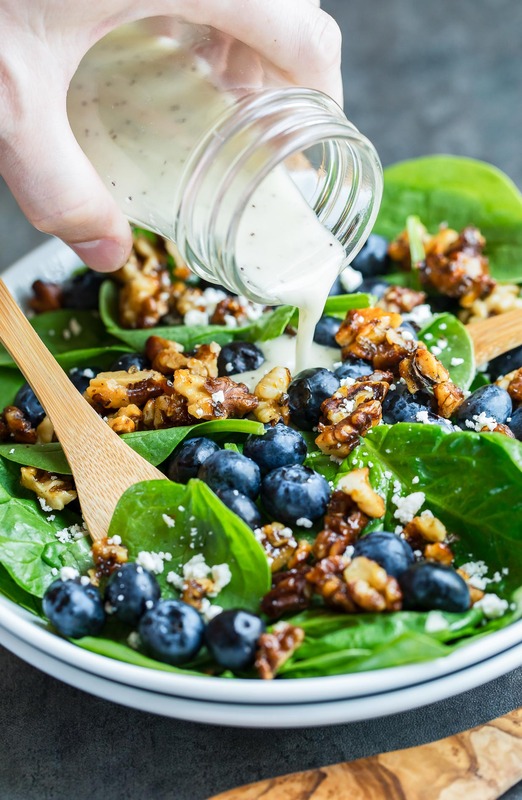 Tender spinach leaves are topped with fresh, ripe blueberries, creamy feta cheese, and sweet candied walnuts, then tossed in a lemony dressing to bring it all together. So. Much. Yum. This fresh and fruity Blueberry Spinach Salad is tossed with a homemade lemon poppyseed dressing that is crazy easy to make with just a few tasty ingredients! We love ours topped with candied walnuts and creamy feta the ultimate fruit and veggie salad. Recipe serves 2 large salads or 4 side salads. First make your dressing! Blend lemon juice, onion, honey/sugar, Dijon mustard, salt and pepper in a blender until smooth. Stream avocado oil slowly into the mixture while blender is running to fully incorporate. Add poppy seeds and pulse blender a few times, just to mix seeds into the dressing. You can also use an immersion blender or food processor if needed. Set dressing in the fridge to chill for a few minutes if a chilled dressing is preferred. 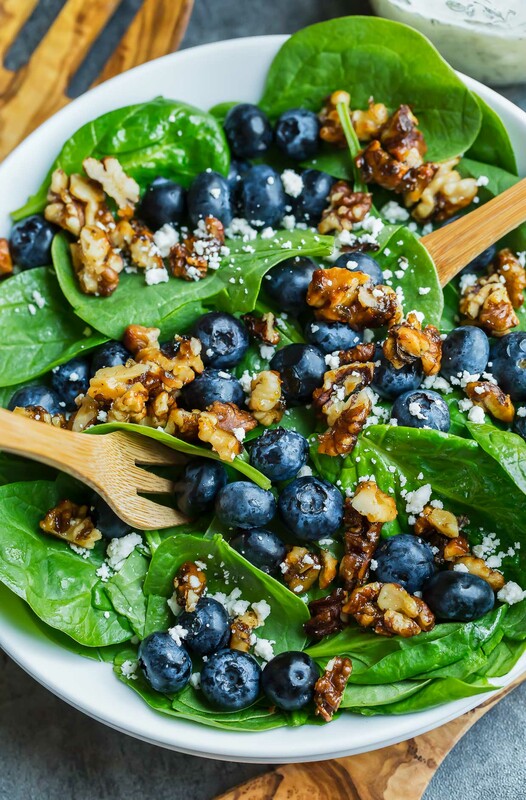 Wash and dry your spinach and combine with blueberries, feta, and candied walnuts in a large bowl (you want to have enough room to toss the salad without everything flying all over your counter, lol) - Add 1/3 of the dressing to the salad and toss/mix until spinach is coated. Serve right away with additional dressing on the side (add extra to taste) and feel free to save some for later if you have a little leftover! When it comes to the feta, blueberries, and candied walnuts, feel free to add extra if desired! Salads are crazy flexible to suit varied tastes so keep it light or load 'em up! I like a little extra feta on mine! * See post below for my recipe for 5 minute homemade candied walnuts. You can use store bought or homemade here. Candied pecans or honey roasted almonds also work great! Looking to get a little bit "extra" with this simple salad? Go for it! Thinly sliced red onion makes a great addition and so do roasted sunflower seeds. If skipping the candied nuts in favor of plain toasted walnuts or pecans, you may want to sweeten the dressing a tad more as the sweet nuts help balance the lemony dressing. Simply adjust to taste and you're good to go! I first fell in love with homemade candied walnuts back when I made my now-famous Cranberry Quinoa Salad and I’ve been using them as a sweet and nutty salad topper ever since! Sometimes I mix it up by using pecans in place of walnuts (both are crazy delicious) and other times I’ll toss some almonds into the mix. You can totally buy them pre-candied at the supermarket but when making your own only takes 5 minutes, it feels like cheating to buy them! The recipe below makes a little more than you’ll need for the salad above so you can add extra to your salad, to taste, or have some to snack on for later! If you’d like to make these ahead of time, simply store in an airtight container in the pantry. They should keep for a few days, assuming you have the self-control I lack and don’t eat them all up the second they finish cooling. Heat a skillet or saucepan to medium heat and butter to melt. Next add in your chopped walnuts, honey, salt, and sugar. Saute for 5 minutes or until sugar has caramelized a bit and thickened, then pour over parchment paper, using a spatula to separate the nuts. Otherwise you’ll have yummy walnut brittle that you’ll want to break apart over your salad, which is no big deal either! Yum! If this happens or the walnuts seem a bit larger than bite-sized, give them a rough chop once cooled. Allow walnuts to cool for several minutes until the coating hardens and your walnuts have officially been candied! Woot! Try not to eat them all before they hit the salad. 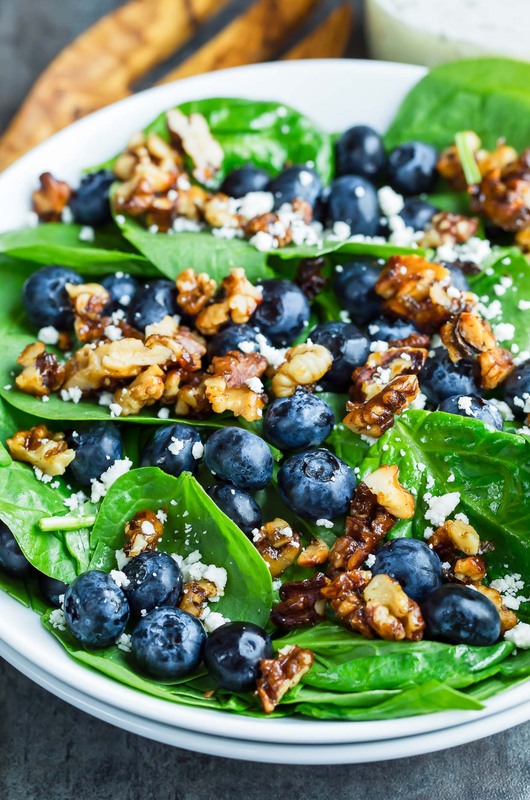 If you get a chance to try this tasty blueberry spinach salad, let me know! Leave some love in the comment form below or tag your photos with @peasandcrayons on Instagram so I can happy dance over your creation! Love this salad. The candied walnuts super easy to make. Already made it twice! So yummy! I love blueberry season too! I love the avocado oil in the dressing! What an awesome salad recipe! I love the combination of flavors in it! It is sooo delicious !! I love it! But I used vegan cheese because I´m vegan. Love the addition of vegan cheese here and so glad you enjoyed the recipe! Yay!